At this time, we do not recommend Bodog. Instead, we suggest signing up at 888 Poker. 888 is our top online poker room which offers all new players a $600 bonus. All links will redirect to 888. Whatever sport is your passion Bodog Poker has it covered, from NFL Football to the March Madness of NCAA Basketball and everything in-between. Plus you can enjoy a full Las Vegas style casino experience with over 75 games, easily downloaded at the click of a button. You can also play in Bodog’s exciting and growing multi-player poker community. Opened in September 2004, the card room features Texas Hold’em, Omaha and Omaha High Low, 7 Card Stud, and 7 Card Stud High Low. Of the games offered at Bodog, most people play low stakes No-limit Hold’em ($200nl and below), with more playing full ring as opposed to shorthanded. They also offer heads-up cash tables for both Limit and No Limit Hold’em. Omaha is moderately popular and there are usually 10 or so active tables off-peak. The same can not be said for Stud however and you’re lucky to find one or two tables for 7 Card/5 Card. Sit and Go tournaments at BodogPoker are quite popular and generate just as much traffic as their ring games. There are usually 30-50 running at a time, mostly below $10. There are some running at higher stakes, but most of the action is concentrated towards the lower limits. They offer regular, turbo, super turbo, shorthanded, and Heads-up S&Gs. Strangely, their S&G tables have 10 player seats whereas their full ring cash tables only offer 9. One thing to note is some tournaments have differing payouts and blind structures. For example, their beginner tournaments pay 5 places rather than 3, 30% for 1st down to 10% for 5th. Experienced players would consider these a waste of time since the max you can win is less than 3x your buy-in (including entry fee) but it would reduce your variance a lot, which could be good for a beginner. One negative thing is Sit & Goes do not use their own tournament lobbies, which can be a minor annoyance. The Bodog Poker Room features daily tournaments with a monthly guaranteed prize pool of more than $1.8 million, as well as a $100,000 guaranteed ($100 + $9 buy-in) tournament each Sunday. Daily guarantees include: $1000 ($2 rebuy), $2000 ($15 + $1 freeze-out), $5000 ($30 + $3 freeze-out), $8,000 ($50 + $5 freeze-out), $10,000 ($100 + $9), and $15,000 ($55 + $5 freeze-out). Bodog Poker also offers guaranteed seats to the World Poker Tour and the World Series of Poker, including the WSOP Europe. You can also find many freeroll tournaments, including $500 and $1000 daily freerolls. Some of these require points to buy into, but most have no restrictions and can have fields as large as 5000. While playing at Bodog Poker, you will earn ‘Bodog Poker Points.’ These points can be used for a few different things, including earning bonuses and special tournaments. You will earn points for playing a raked hand in cash games (1 point max), 3 points for every $1 in tournament fees, and even points for playing at cash tables! Earning points is explained in detail below in the Bonuses section. Bodog is a well-established company and brand, dating back to the emergence of the Bodog Sportsbook in 1994. In 1999 the Bodog Casino was born, offering 4 casino-style games, which by 2004 had grown to over 50. And finally, in September 2004 the Bodog Poker Room was introduced. So, even though the Poker Room is relatively new, Bodog have been around for a long time. Bodog’s Sportsbook is considered to be an industry leader, with their sports content and expertise translated into mainstream media attention. Major organizations such as ESPN, The New York Times, USA Today, CNN, CBS, and VH1 are just a few of the media outlets that have turned to Bodog for betting information and commentary. 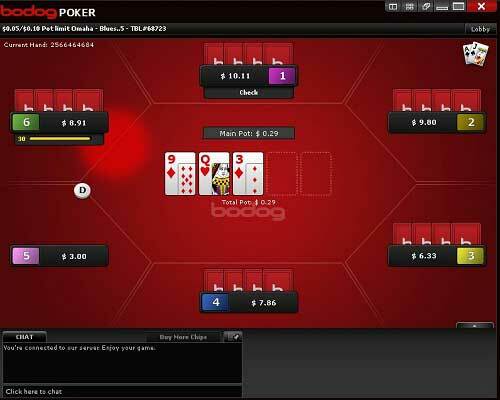 Bodog Poker offers one of the top software/interfaces today. Everything is well engineered and that helps the tempo of the game. Tabs organize the lobby and games can be hidden or filtered to show only the results you want. The lobby has a quick seat option that can be really useful to grab a spot in a Sit & Go. It is not really needed for ring games, as it is fairly easy to find one by viewing them and you can select the best tables that way. Under preferences there are some options that can be changed, such as 4 color deck, avatars, show bet/pot amount, and hand strength viewer. In 2011, Bodog revamped their software. The biggest change is the implementation of anonymous tables. Now, you are literally a number when you sit down. Players are numbered 1 – 9, there are no screen names, handles, etc. At the top of the table screen, there are buttons that will tile and cascade your tables, assuming you play more than one, which is useful. Finally, Bodog Poker has introduced a rabbit cam feature that allows you to see what subsequent streets would have been if you did not fold. For example, say you have a flush draw and an opponent puts you all-in on the turn. You can fold and use the rabbit cam to look at the river. The table view at Bodog Poker is different than any other online poker room today. There is no time bank, which really heightens the tempo and speed of play. Players are given enough time to make a decision, but not too much to hold up the game. The default table layout is plain yet appealing and you can also change the felt color to anything you’d like. Players are given the option to upload custom avatars, which helps to easily distinguish between players. Chat and game details are displayed in the bottom right, and can be moved into a pop-up window. You also have the option to assign notes to specific players. One minor frustration is the lobby for both sit & go and multi-table tournaments. 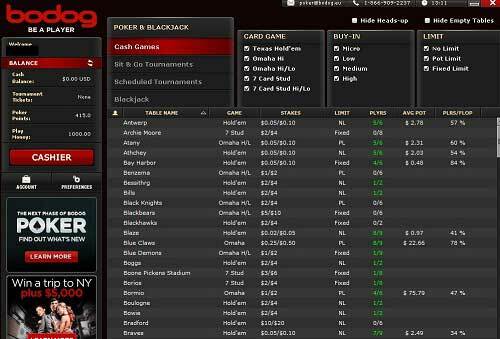 Instead of separate windows, Bodog features the tournament lobbies within the main lobby as tabs. This may be irritating for players that are used to having the lobbies in separate windows. There are a couple of very frustrating problems with Bodog Poker. The first is the multi-table limitations. You can only play up to 4 tables of cash games and up to 20 tournaments/sit and gos. Bodog has added on interesting feature to their hand history system, however. Pending a 24 hour waiting period, players will now be able to obtain hand histories which show not only their own hole cards, but those of every other player at the table. This could prove to be an incredibly useful learning tool, should an individual decide to put in the necessary amount of study. In order to get their hands on this data, players will need to look under the “Account” area of the poker client. This is a truly unique feature, found at none of the other top poker rooms. Bodog Poker has grown a lot since adding poker games in 2004. It was a slow start, with only about 800 players on average. Their traffic numbers had grown to around 5000, but have now slipped back to a 24 hour average of almost 1000. Bodog is one of the few rooms that allow US customers to play for real money. A few things need to be changed if they want to become one of the big names (like hand history and multi-table limit, etc.) but they are in the top 20, which is good for a room with its own network. The company had to switch from Bodog.com to NewBodog.com and then to BodogLife.com in 2007 after being sued. However, in April 2009 a third party arrived to settle the case and buy back the Bodog.com domain name. Then in 2011, Bodog switched to Bodog.eu. Now all four addresses link to the same site. In late 2011, Bodog added a few more features to increase the action. First, players can join more tables. You can play 4 cash fames or SnGs and up to 20 MTTs at the same time! Bodog has also introduced several new tournament formats including Omaha, Heads-up, and shootout. Finally, players can play a little Blackjack at the poker table by clicking the “21” icon! Bodog Poker is one of the fishiest US-friendly sites around today. It still doesn’t compare to the old days of PartyPoker, but there are a large number of fish and some large whales. One nice thing about the multi-table limit is the sharks can only feed on four tables at a time, so it makes table selection a bit easier for everyone (easier still for the sharks if they would raise the limit!). Low stakes tables are easy to come by, but off-peak mid-stakes or higher tend to be quite slow. If you’re looking for a new room to try out and having trouble finding one (especially if you’re in the US) we recommend Bodog. It seems like it’s one of those rooms that everyone has heard of but not many have played at. The Bodog Poker bonus has recently been upgraded to a hefty 100% up to $1000! In order to collect this money, you must earn ‘Bodog Poker Points’ by playing real money ring games or tournaments. For each $1 in bonus money, you must earn 10 Bodog Poker Points. Intervals of the bonus will then be released when you hit 100, 500, 1,500, 3,000, 6,000, and 10,000 points. At 100 points you’ll earn $10, at 500 points you’ll earn $50 total bonus dollars (so $40), and this will go on and on until you have earned $1,000! Point accumulation occurs at the end of every hand. 2. Tournaments – You can accumulate Bodog Poker Points for every $1.00 in fees paid for each tournament you enter. Three Points are awarded for every $1.00 in fees paid; therefore, a player would get 15 Bodog Poker Points for entering a tournament with an entry of $50+$5 (buy in + fee). Click here to join Bodog Poker! The Sportsbook at Bodog.com is one thing that separates it from other poker rooms. How many times have you seen a spread that looked way off? You may have wanted to bet on it but didn’t know of anyone going to Vegas at the time and you didn’t know any bookies. Once you signup for Bodog Poker you can easily use that same account and password to bet on sports. Bet on a football game in their Sportsbook or on a basketball game. One big thing most poker players and fans might not know about are the prop bets Bodog has setup for each WSOP. There are many poker prop bets in place, and you can bet on your favorite poker player to have a deep run in the main event. The variety of bets are very wide, anything from: Will a player win 2 or more bracelets? Will Phil Hellmuth win his another bracelet? Which professional will last longer out of Doyle Brunson, Daniel Negreanu, Phil Ivey? And of course there are more. From Bodog Poker, go to Links – Sports Book or click here to go directly to their sportsbook. Who will replace Simon Cowell as judge of American Idol? Who’s first album will debut higher on the Billboard 100? Bodog is a monster in the industry, so it’s sure they’ll use some of their muscle to move traffic into their poker room eventually. It is nice to have everything under one account without having to worry about some non-trustworthy sportsbook. Bodog.com is the leader in the online sports betting industry, so feel comfortable signing up with them. To join the Bodog poker room, casino, and sportsbook, visit Bodog Poker! Bodog Poker was well known for a speedy email response prior to their legal issues. The deluge of questions they received did slow them down to a degree, but now the case is over things are expected to return to normal. They also offer a toll-free telephone number, which gives very quick responses.